DETROIT (Reuters) - General Motors Co on Monday showed its Chevrolet Bolt concept car with an electric driving range of more than 200 miles and a $30,000 price tag, offering a view into where the U.S. automaker is pushing in development of electric vehicles (EV). The all-electric Bolt is a concept car not currently slated for production, but Chief Executive Officer Mary Barra said the company is committed to developing an affordable, long-range EV, and GM said they could develop the car in as little as 18 months. "This is a real game changer," Barra told reporters at the media preview at the Detroit auto show. "Trust me, this is no stripped-down science experiment." She didn't give a timetable for when GM would develop the vehicle, but said it was a natural next step from the Volt. GM is showing a new version of the Volt on Monday, and the 2016 version will debut this fall. 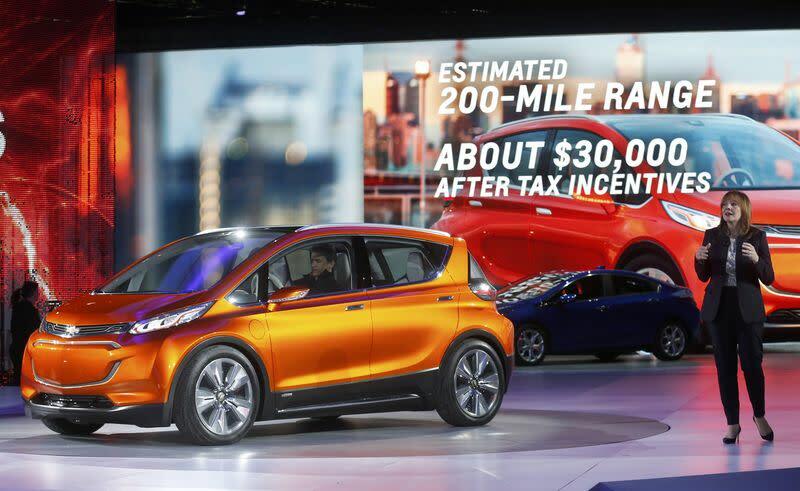 GM product development chief Mark Reuss said the automaker "has the technology" to deliver a production version of the Bolt electric car within 18 to 24 months. Reuss said the four-door, five-passenger prototype could be profitable, especially if the value of emissions credits it generates under clean air regulations is counted. The current version of the Volt, which has an electric driving range of about 40 miles before a gasoline engine kicks in, starts at $34,345, and analysts have said GM loses money on the car. The new Volt has an electric driving range of 50 miles.